Hi Dina in Germany! Happy Dog of the Day! You are just too precious for words, Dina! I simply adore Min Pins! You guys and girls pack so much personality and heart into that wee frame, though I have to admit that years ago I did think Miniature Pinschers were Dobie puppies! Nope, you're a very special breed unto your own! How lucky your young human is, having a best furry friend as beautiful, as sweet and playful, as loyal and loving as you, Dina! And what a lucky girl you are, having a young guardian as responsible, as devoted and caring as yours! What a team! You truly are one EXTRA special girl, Dina, beautiful in looks and in personality, simply the best! Thanks for starting my day off with a BIG smile, sweetheart! I hope you're enjoying a very special day of celebration...tearing apart another rope, hehe, spending fun time with your human, chowing down on some yummy treats, being loved and pampered to pieces! Lots of love, cuddles and kisses to you, adorable Dina, our very special and most deserving Dog of the Day, EVERY day! 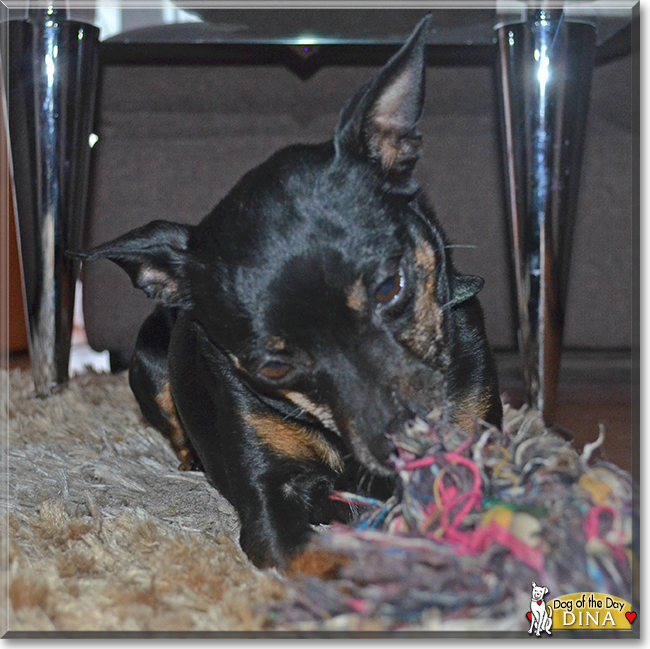 Dearest Dina, what a beautiful Miniature Pinscher you are! You have sleek, pretty black and brown fur and the sweetest face with those lovely big eyes. Your dear young friend feeds you every day, and you play together after she/he gets home from school. You love your rope toy, so much that you destroyed the old one and your people had to buy you another. You and your dear young friend love each other very much, don't you. What a wonderful love-filled home you share! Congratulations, darling Dina, on being chosen today's Dog of the Day! We hope you and your dear young friend and all your family and friends are enjoying a fine celebration, full of fun and lovies and all your favorite games and treats. What a little sweetheart who plays with her person every day. From your picture, you sure do like those rope toys. Dina is an excellent DOTD! What a delight to see her today, she is so pretty and shiny and sweet!! my dad has a miniature pinscher chihuahua mix an people all the time think shes a doberman puppy as well. congratulations on her being Dog of the Day! Congratulations on being DOTD Darling Dina!